Do air purifiers work? Most people have no clue that their indoor air quality is likely littered with indoor air pollution. Based on the sheer volume of indoor air pollutants dwelling in our homes is yes, air purification is beneficial. Be alleviated by air purifiers, particularly those that produce zero ozone – a noxious gas. Just above, you learned that the air in your home is littered with pollutants like dust, molds, and more. On top of that, here’s another gigantic number: about 40,000 dust mites can live in just one ounce of dust. Not only is that a bit creepy to think about, but these dust mites can increase the chance of asthma development. A room air purifier can help alleviate your home of these pollutants, especially in high-traffic areas where pollutants are more likely to get kicked up. Ultimately, by keeping a clean home, and supplementing that cleanliness with a room air purifier such as the Aprilaire Clean 9550, you and your family should enjoy a healthier home. Doesn’t it seem like the more we talk about “allergy seasons,” the more it seems as though dealing with allergies is a yearlong endeavor? From hay fever in the spring to ragweed in the fall, various types of allergies can pop up throughout the year, leading to discomfort. In fact, some people even suffer from allergies in the winter when their windows are closed and they’re shut in with their allergens. In addition to keeping a cleaner home, those with respiratory conditions will want to use a room air purifier. If you suffer from allergies, regardless of whether or not you have a whole home air purifier installed in your home, consider a room air purifier like the Aprilaire Allergy 9550 to provide that extra burst of fresh air throughout allergy season – even if “allergy season” lasts all year. Did you know that there’s no such thing as a hypoallergenic pet? Some pets simply produce less allergens than others. Additionally, contrary to what many believe, an allergic reaction to pets typically is not caused by an animal’s fur or hair. In fact, pet allergies are largely due to pet saliva, urine and dander. That said, we’d never tell a pet owner to disown their precious pets. They’re part of the family! Instead, use an air purifier to help clean the air and even reduce pet odors. A whole home purifier is ideal for all pet owners. 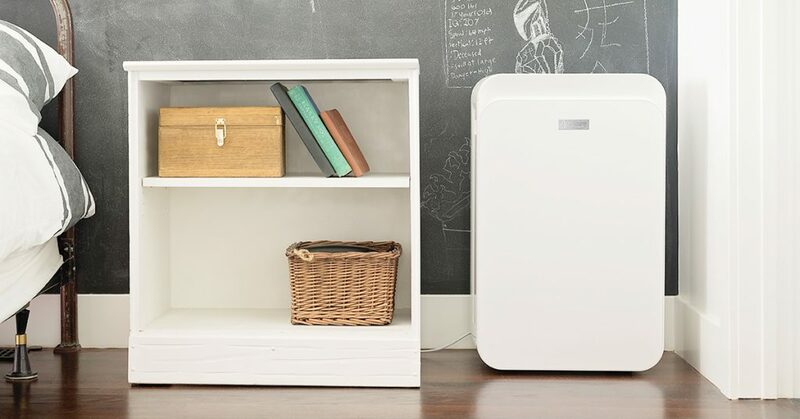 However, for those who live in smaller dorms, rentals or simply don’t have a whole home air purifier installed, a room air purifier like the Aprilaire Allergy + Pet9550 is a perfect way to add a supplemental burst of fresh air all year long. Shop for an Aprilaire room air purifier today. You can also learn more about using a room air purifier to clear the air you and your family breathe with our handy Healthy Home 101 Blueprints, guides to help you build a healthy home.